Dental bonding is very similar to the procedure of applying composite fillings. A composite filling is used to restore a broken, worn, fractured, or decayed tooth, whereby the affected portion of the tooth is removed and the remaining section filled with composite filling. The filling can also be used to close gaps between teeth. 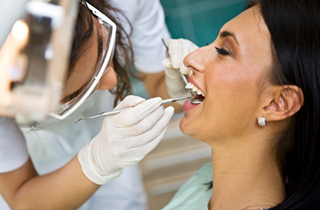 Composite fillings are placed in a single appointment. The affected tooth is first numbed so the decay can be removed. The space on the tooth is then thoroughly cleaned and prepared before placing the new filling. Usually, the damage on the tooth is not bad enough to reach the tooth nerve, but if it does, a special medication has to be applied for extra protection. When all preparations are done, the composite filling is precisely placed, shaped, and polished, successfully restoring your tooth to its original form and function. After a successful treatment you may experience some sensitivity to hot and cold, but it should subside as the tooth acclimates to the filling. Proper oral hygiene, good eating habits, and regular dental check-ups will help to prolong the life of your new composite filling. They’re direct fillings, which means they can be placed in a single appointment. Aesthetically suited for the restoration of front teeth or more visible areas for your confidence. Support and preservation of the remaining tooth structure as composites bond to the tooth, insulating the tooth from extreme temperature changes and breakage. Durability, so you can be assured of a long-lasting beautiful smile. Still, no filling lasts forever and it will need replacing. There’s an increasing need for the use of more cosmetically pleasing materials, and with more people choosing to replace their silver fillings with tooth-colored material, there are more dentists with both the skill and experience to make the change successfully. They’re not as hard as amalgam or gold fillings, which means that you will need to replace them more times. They also cost more than silver fillings because they are more difficult to place, but proper dental practices can reduce the frequency of filling replacement. Are there other tooth-colored filling materials? Yes. Composite is the most common, but you can also choose glass-ionomer materials in teeth where you do not bite down hard, or porcelain materials, like porcelain and metal, for a strong tooth-colored crown. For more information on dental bonding and/or composite filling tooth restoration procedures including pricing & cost info, please call our office @ (661) 725-9105 or conveniently contact us online.